London handkerchief pocket square gift set featuring three exquisitely illustrated monochrome handkerchiefs: London Buildings, Icons and Wildlife. 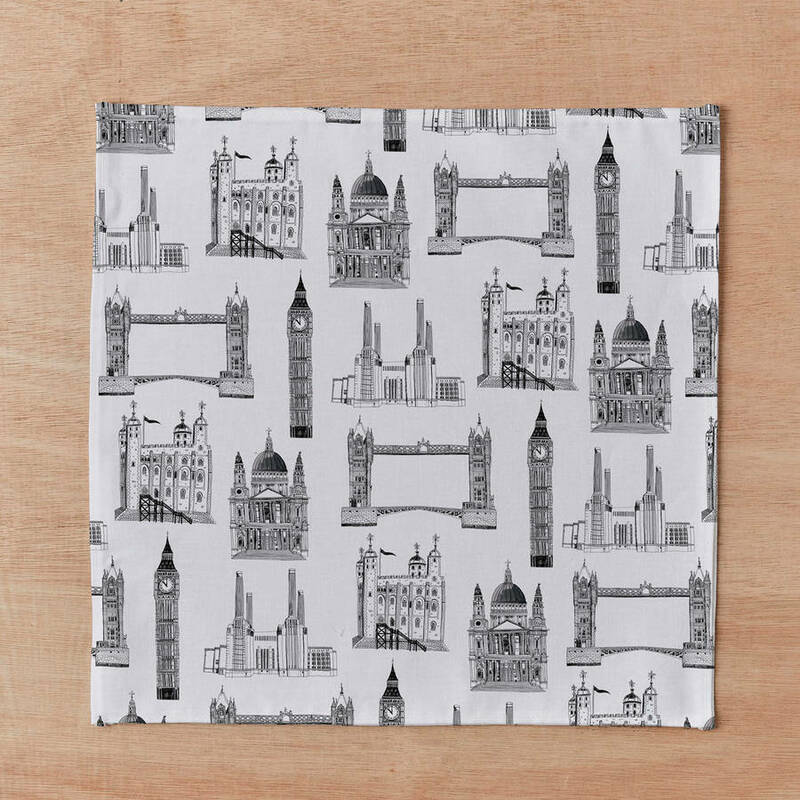 London Buildings handkerchief pocket square, featuring bold, monochrome illustrations of iconic London landmarks including Big Ben, Battersea Power Station, Tower Bridge and St Paul’s Cathedral in a repeat pattern. 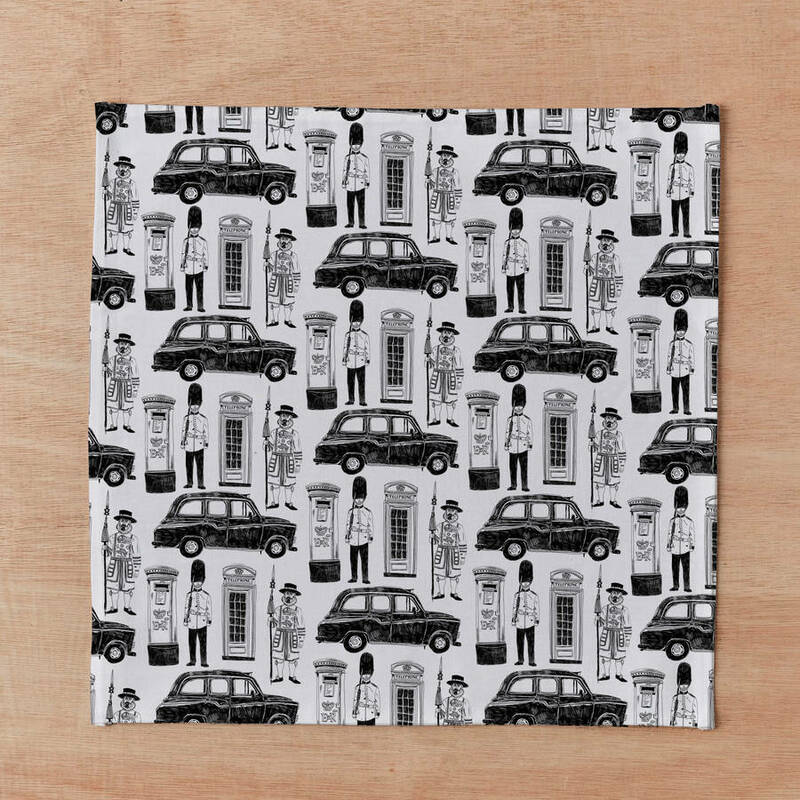 London Icons handkerchief pocket square, featuring striking, black and white illustrations of iconic London symbols including the black cab, postbox, telephone box, Queen’s Guard and Beefeater in a repeat pattern. 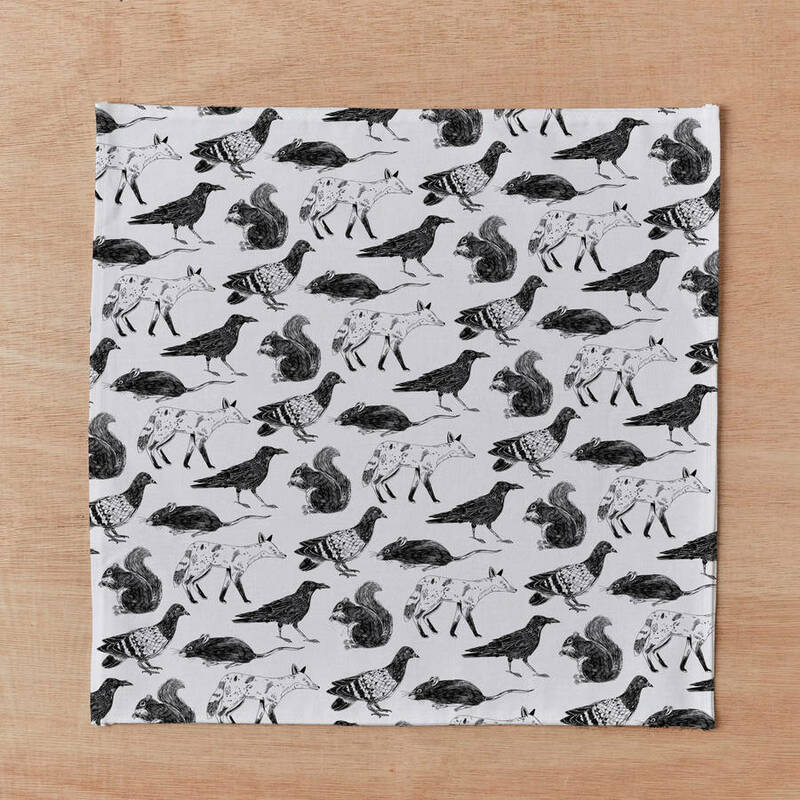 London Wildlife handkerchief pocket square, featuring bold, monochrome illustrations of well-known London animals including pigeons, squirrels, foxes, ravens and mice in a repeat pattern. Our dapper London handkerchiefs can also double up as charming pocket squares, and will make a stylish gift or stocking filler for London lovers, architecture enthusiasts and modern-day gentlemen or women.These stylish handkerchiefs are great sartorial accessories and will add wit and personality to a blazer or suit, whether you’re heading for a wedding, a special event or occasion. Our handkerchiefs are illustrated by James Barker in his studio in the heart of London and sewn to perfection in Lancashire, UK. Our illustrated patterns are printed onto 100% high-quality cotton fabric and are vibrant in colour. The handkerchief gift set comes presented in a lovely cream matchbox-style gift box. 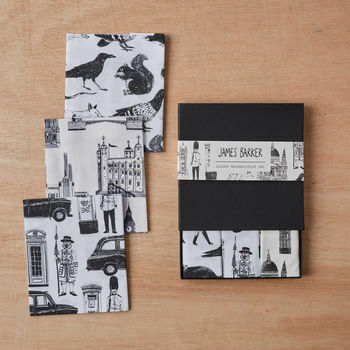 Our London handkerchief gift set comes presented in a lovely black matchbox-style gift box. 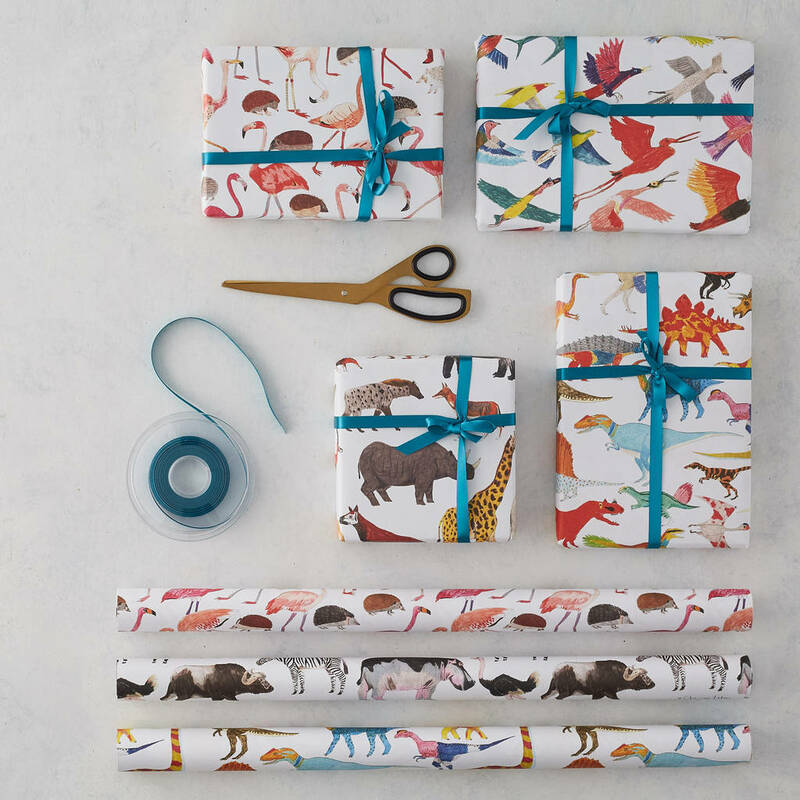 Alternatively you can customise this gift and pick three handkerchiefs of your choice neatly presented in a box set. This option can be found in a further listing on our shop page. Neatly presented in a H13 x W13 x D1.5cm, H5.11 x W5.11 x D0.59in box.